From Hours of the Holy Spirit, 'Officium de Sancto Spiritu'. Die römischen Mosaiken und Mareleien der kirchlichen Bauten vom IV. Bis XIII, Jahrhundert (1916). When can I enter and see the face of God?" He said that "the deer who drink became in ancient Christian art the symbol of baptism par excellence. 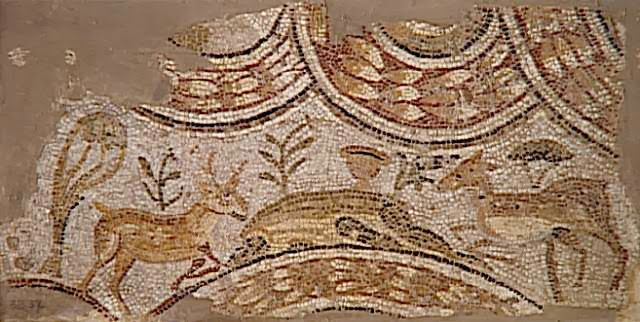 In fact their images appear in all the baptistries of which we have sufficient remnants or in literary works"
From the earliest times the symbol of deer drinking at the water of life was part of the ceremony of baptism. "Such "longing" indeed is not found in all who enter the Church: let all however who have "tasted" the sweetness "of the Lord," and who own in Christ that for which they have a relish, think that they are not the only ones; but that there are such seeds scattered throughout "the field" of the Lord, this whole earth: and that there is a certain Christian unity, whose voice thus speaks, "Like as the hart desires the water-brooks, so longs my soul after You, O God." And indeed it is not ill understood as the cry of those, who being as yet Catechumens, are hastening to the grace of the holy Font. On which account too this Psalm is ordinarily chanted on those occasions, that they may long for the Fountain of remission of sins, even "as the hart for the water-brooks." Let this be allowed; and this meaning retain its place in the Church; a place both truthful and sanctioned by usage. Nevertheless, it appears to me, my brethren, that such "a longing" is not fully satisfied even in the faithful in Baptism: but that haply, if they know where they are sojourning, and whither they have to remove from hence, their "longing" is kindled in even greater intensity.."
"12 giving thanks to the Father, who has made you fit to share in the inheritance of the holy ones in light. 14 in whom we have redemption, the forgiveness of sins." It is an extraordinary experience to stand in front of one of the Petworth Turners and then look through the window at the side to see the scene he had painted.